The independent developer has ascended, and the new business model demands agility. You have to be able to work on all aspects of game creation, and your team’s game will publish directly to platforms like Android, iPhone, and Facebook. You’ll use Unity, the hottest game engine out there, to do it. In order to earn your place on the elite development team, you must master both sides of the development coin: art and programming. 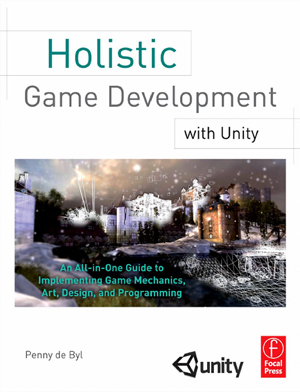 Holistic Game Development with Unity is an authoritative guide to creating games in Unity. Taking you through game design, programming, and art, Penny de Byl uses a holistic approach to equip you with the multidisciplinary skills you need for the independent games industry. Very happy with this book, I’ve given several Unity books a shot and yours is by far the best. Basing a programming book on Drawing on the Right Side of the Brain was a stroke of genius. First thing I will say is that this is one of the first technical books I have read cover to cover in a long time. These are the project files required to complete the Hands-On exercises in Holistic Game Development with Unity.